Will do. 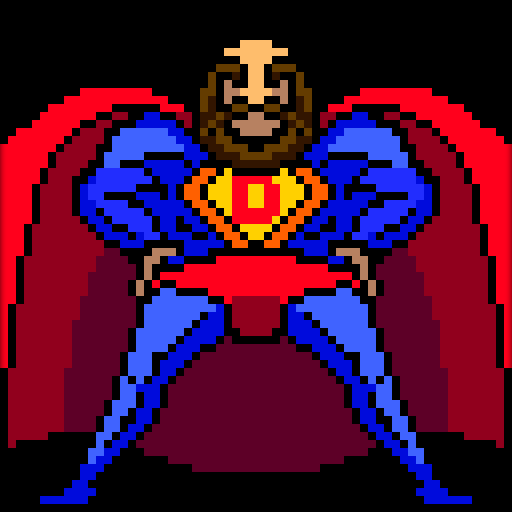 To other dorf requesters: You have been dorfed, and I updated the main posts. Fully finishing the farming industry so we can start making paper, cloth, etc. Build a library, as all the abstract needs are pretty intense, it seems. Get cracking on the above-ground fort, walls, bailies, etc. Build a massive temple. This is actually half-started, but I was thinking of also adding lots of small shrines/temples. 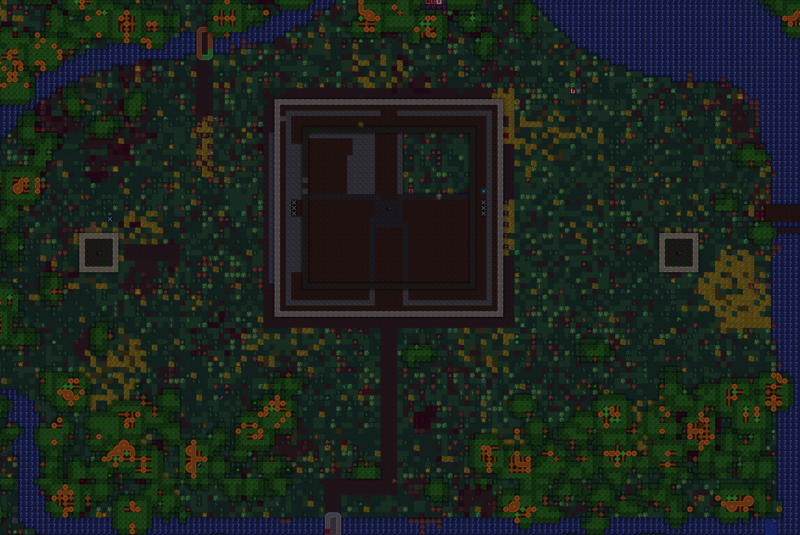 It also seems odd, given where the fort is at, that there has not been a siege yet. 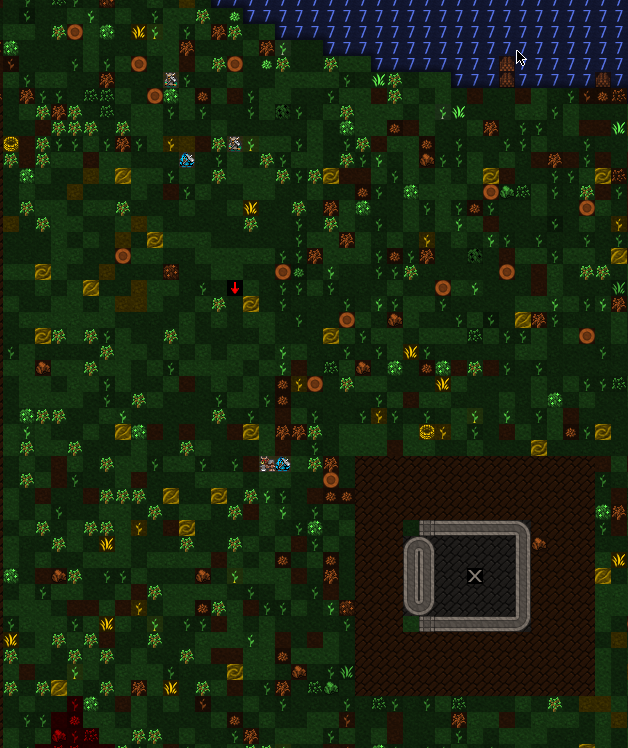 There are goblins within a few days distance and we started on year 5, so there should be titans and megabeasts about. I am planning to hold tight on conquest until after our first siege, but I may set a deadline on that if no big bads come knocking. Our council has met, and we have drawn up plans for the year. We will continue training first and foremost, looking for ways to test our mettle. After that, we will focus on continuing to bolster our living spaces, and try to streamline industry. If possible we will also begin expanding our above ground presence. We Just got our first petitioner, and we were not sure what to do. Personally, I’d send them packing, but the council has decided to allow them to stay and see how they do. Elves are here again. We’ll see what we have to dump on them. We are also going to move Bembul, our trader, out of the militia. It is causing too much disruption to trading and to training to keep him there, as we keep having to remove him from the squad in spring, summer and fall. The elves had barely anything, but we picked up a wolf for Lord Lemon. He can train the thing. The guy is crazy about animals for some reason. He keeps eyeing the dogs, too. We just made him a training zone, and we’ll get a kennel built. He can train them all if it keeps him from creeping everyone else out. 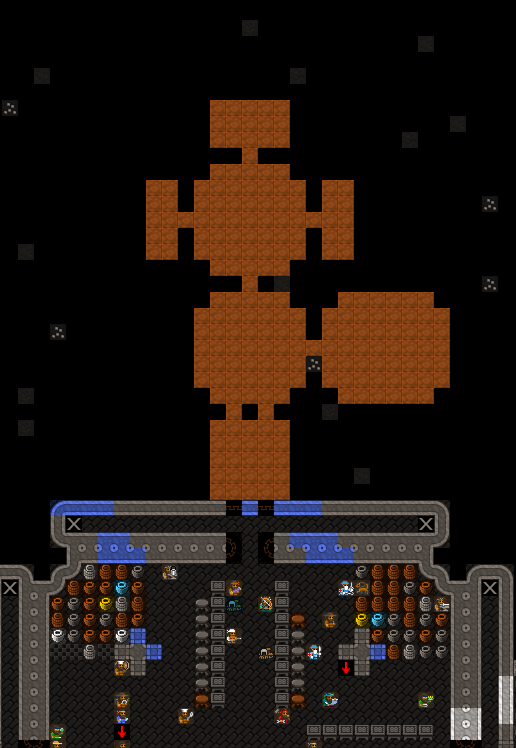 It appears there is a gorlak in the caverns. A small, muscular ball of flesh with a giant tusked mouth. It seems like this might be a good test for our militia. We are deploying the First Axes, my squad, to slay the beast. The battle was short and brutal. Thob Athelaran struck the final blow. 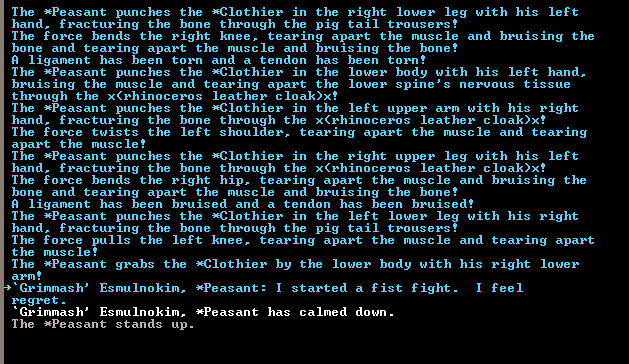 I was prepared for glorious combat, but now I feel a bit overwhelmed. Another gorlak entered our stairwell… We shall dispatch the Axes again. Atis Isanlikot flew to the creature and killed it single-handedly. And now we have troglodytes! Both active squads are moving to intercept. 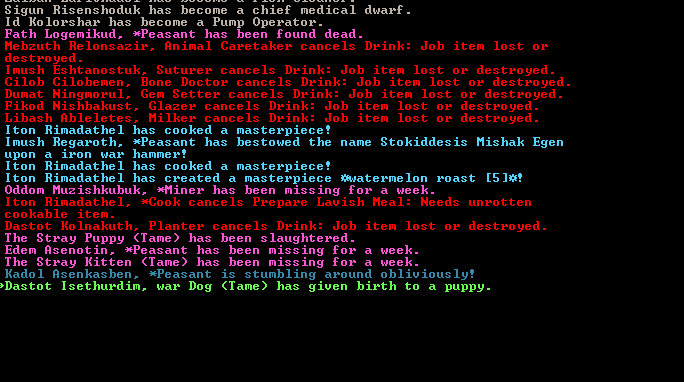 The battle was engaged, and Sigun Risenshoduk, our chief medical dwarf, went into a trance, chasing the foul creatures! In the end, six trogs and two gorlaks were killed this week! While this is not a host of vile fiends, we have bloodied our axes and hammers. Aslo, Doren Rithnomal had a boy while the fighting was going on below..
We had our first military setback today. 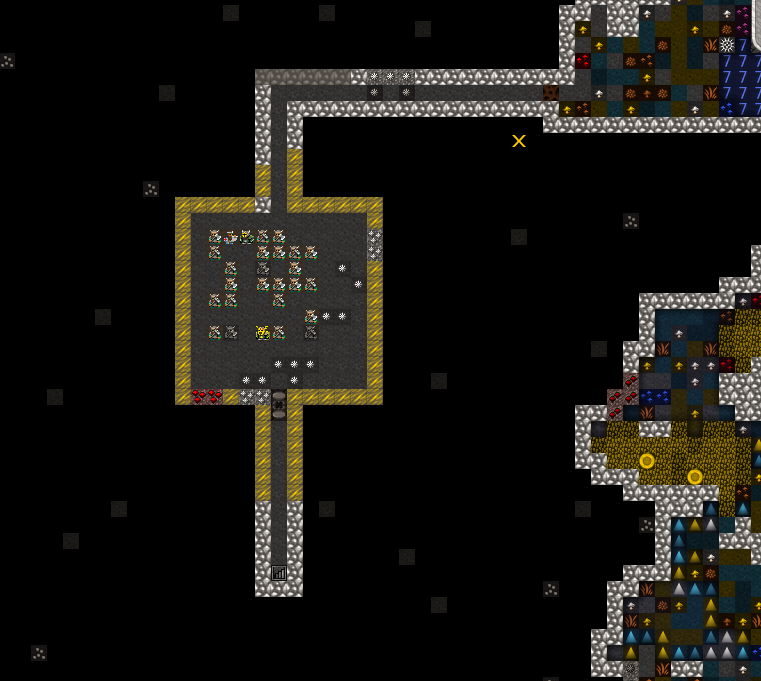 Another group of trogs came into our fortress caverns, and the two fresh squads went to engage. We killed all of the trogs, but Ral Gusilatham, one of our captains, was caught alone in the confusion, and was overcome due to over-exertion. By the time the squads returned to him he had been kicked to death by the fiend. It met a swift end after that. Doren Rithsholid will be promoted to the new leader of the First Hammers. We are designating a temple, to help ease the needs of our people. It is humble, but in time it should grow into something grand. We are using the river flow lever room as the temple, for now. Udil Nosingoltar has been possessed. A troll made it into the stairwell. We made quick work of it. These incursions must stop. We set off the alarm, and closed the last remaining gap in the wall in the cavern. 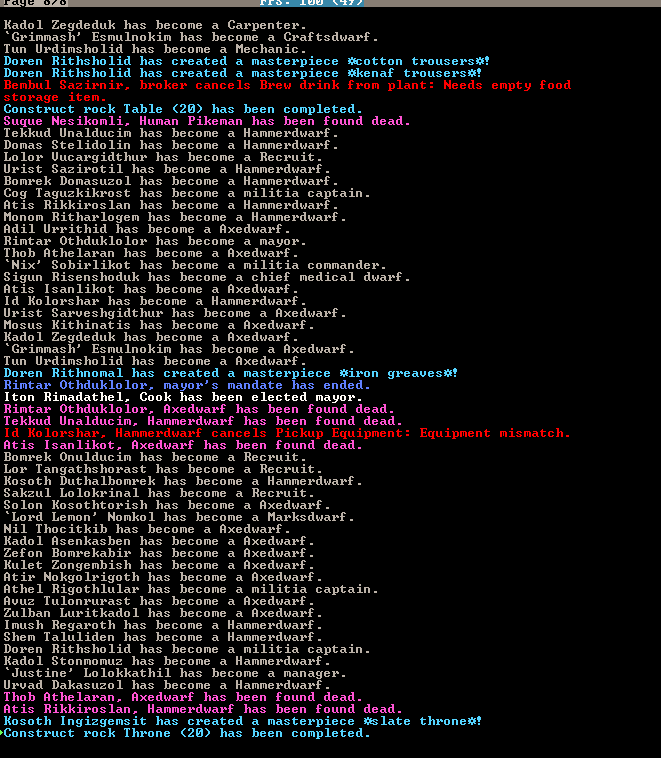 Durpul Gibstrul, the human lord consort, was found dead. 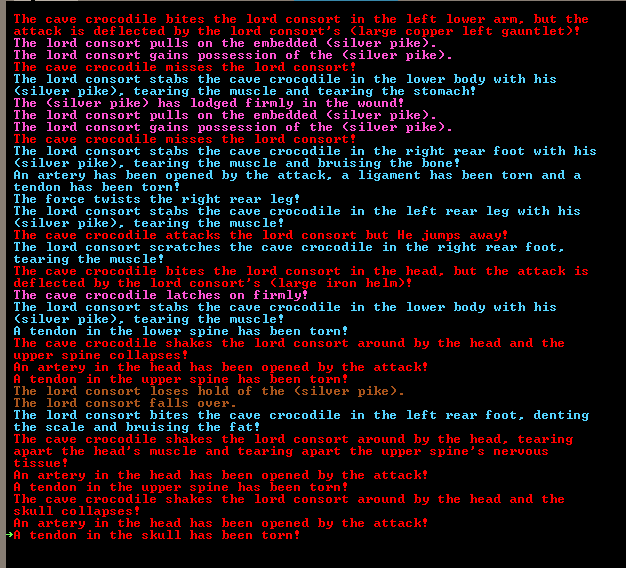 It appears a cave crocodile, Zizkesp, accosted the Gibstrul and killed him. 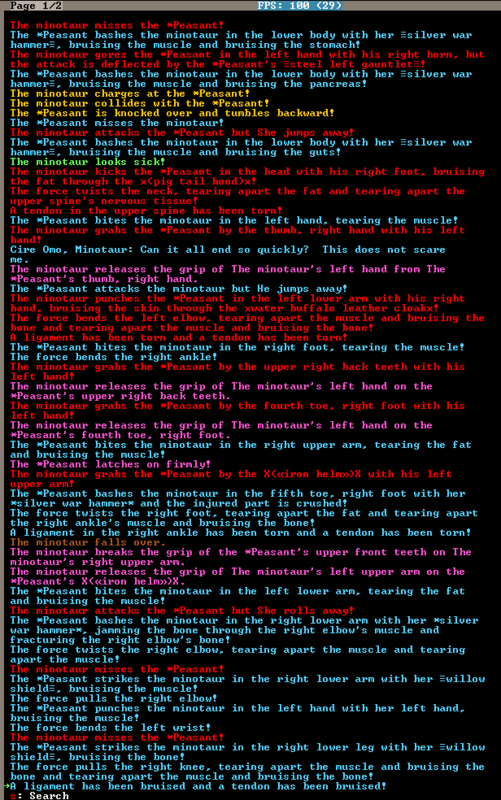 One of our accepted petitioners, Belom Ushuemoth, a human, chased it with his crossbow and dispatched the beast. 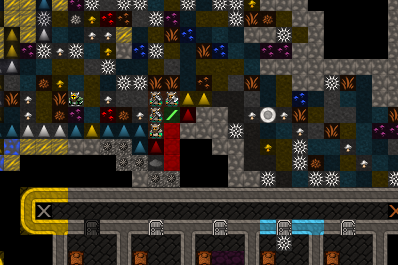 It appears he is now trapped in the catacombs, so we shall create an access tunnel. Thob Uvarkeskal is throwing a tantrum. 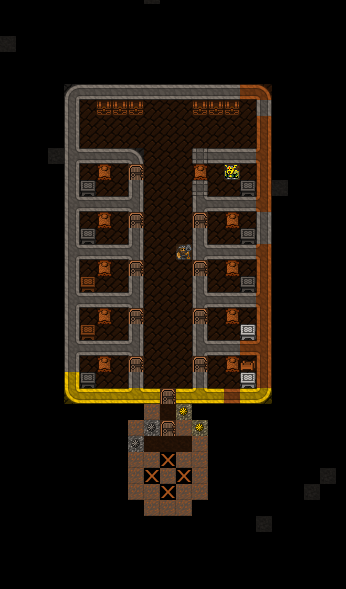 Udil, of the strange mood, claimed a glass furnace we built to try and see what he needed, so at least we guessed right. That guy always liked glass.. He is muttering “Treelifeleatherskinblocksbricksrawgreen” over and over. Thob killed Atis Arollogem, the Mayor. I’d be more upset, but it looks like Thob just demolished him. Rimtar Othduklolor was elected to replace the late mayor. We’ll need to keep an eye on Thob, and make sure this is a one time incident. The humans have come to trade. Udil also began to make his mysterious item… In the end we got more food, cloth, leather from the humans. No morngingstars, unfortunately. Udil made a heirloom bracelet. Why can’t our guys make anything useful, besides my breastplate? Of course we finish the access tunnel to the caverns, and someone (We are all looking at you, Rimtar) finds a giant cave spider. Rimtar escaped, somehow. The squads made quick work of the spider. Asmel the mason took some injuries to the head, however, so we might lose him. His composure is amazing, however. Thob is fighting again. He was by the new access gate to the caverns, just punching people as they went buy! It is time to deal with him. It took a few days, but after he calmed down we assigned him to a burrow with a bed. And then we walled him in. It is unfortunate, but he killed the mayor, and has attacked multiple other residents. Poor Asmel died of his head wound. Another wave of migrants has come. 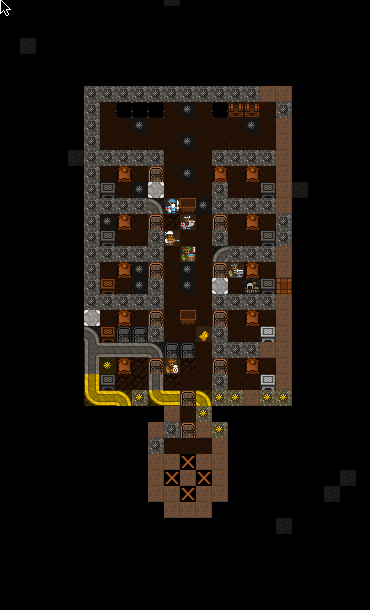 We’ve also decided to start a proper catacomb, and temple complex. Belom, the human, was bitten by a helmet snake while fighting in the caverns. His hand is swollen and the snake stands in the way. Well, it looks like the snake got the best of him. Thob Athelaran, a stonecrafter, has been possessed. He ran off and made a crown. Seriously, guys?!? 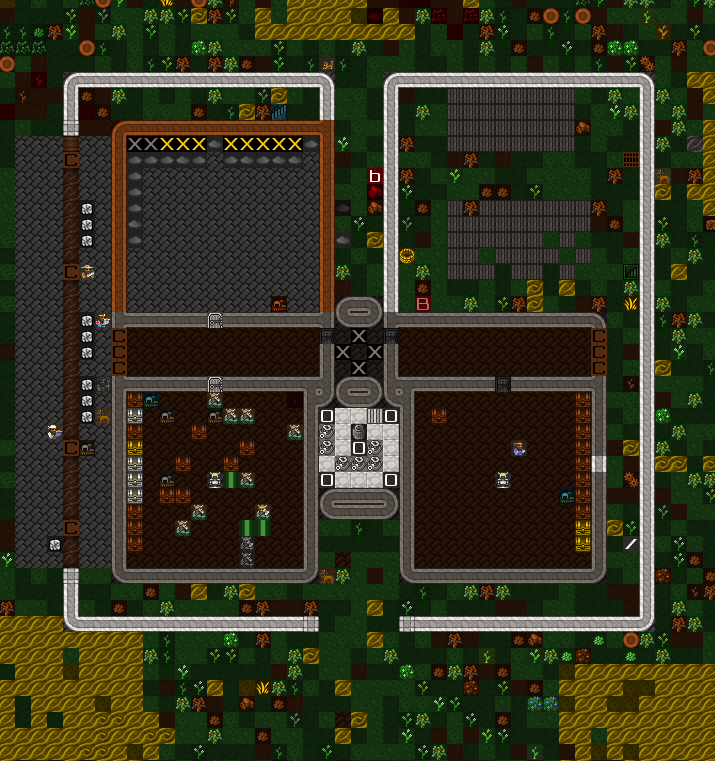 Dwarven traders came. We conducted a massive buyout, taking nearly everything they had in exchange for some spiked balls of various types and prepared meals. Our great temple has been hewn from the stones and we have begun smoothing it. We begin rebuilding the above ground fort. 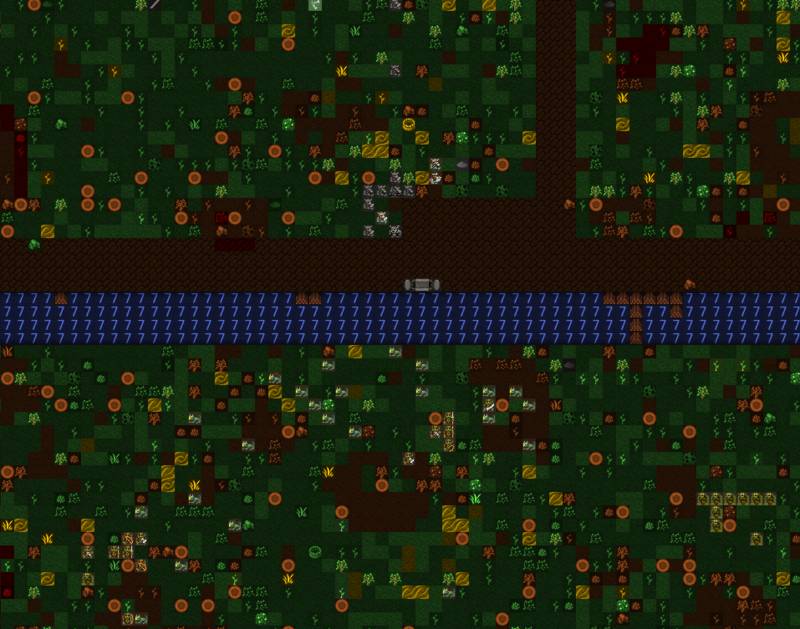 We shall start simply, with stone-walled barracks and roofs, and then expand. Thob Mayorkiller is dead. We have also moved the hospital. We received word that one of the human monster hunters, Suque Nesikomli was found dead. 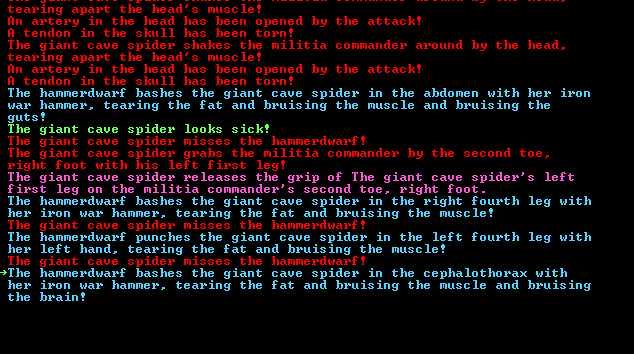 Investigations showed a giant cave spider was loose in our caverns, and had been slain by the beast. We dispatched The First Axes and Second Hammers, the on duty squads. As we had killed a fair few trolls, a previous giant cave spider, and many other denizens of the deep, we thought this too would be no challenge. How wrong we were. 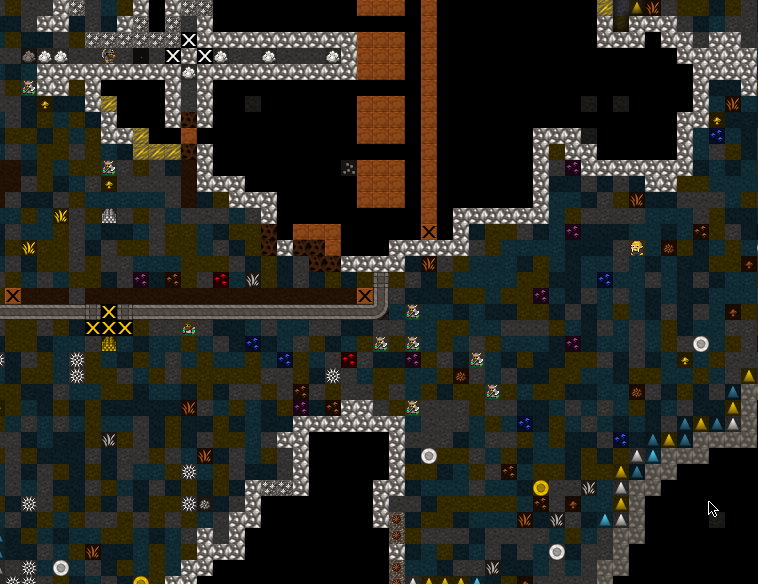 Mayor Rimtar Othduklolor charged in, followed by Tekkud Unaldacim, then Atis Isanlikot, then Thob Athelaran, and two more dwarves, and Nix. 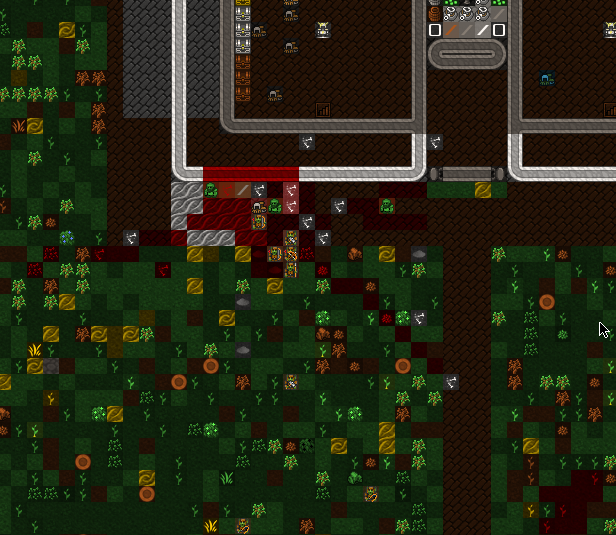 But by running in one at a time, the great spider paralyzed and killed our dwarves in a blood bath. 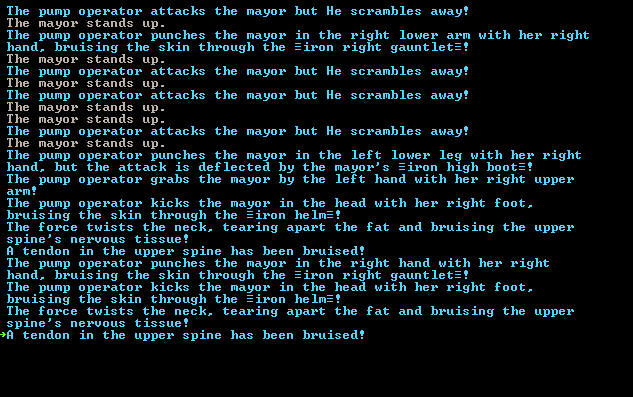 Rimtar was struck in the head, and it clanked off his iron helm, but then the spider grabbed hold and shook our mayor violently, severing tendons and nerves in his neck and head. Paralysis set in and he shaken to death by the beast. Tekkud rushed in with his hammer, crippling two of the crawler’s legs, but a spraw of webs knocked him down and the spider landed a venomous bite. 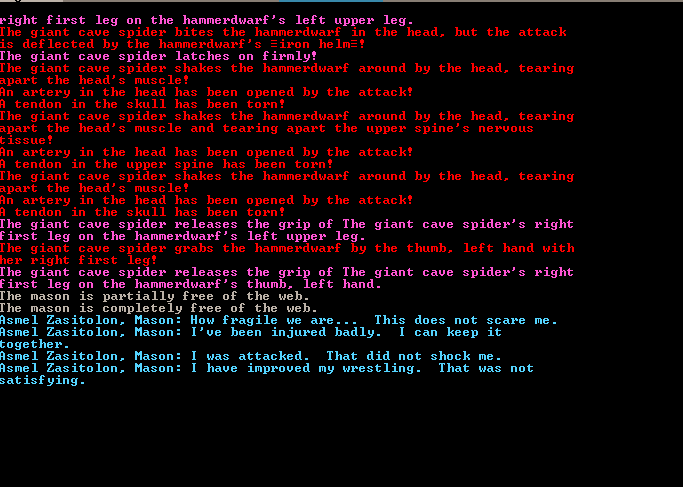 In the ensuing wrestling, Tekkud mangle a third leg, but the spider still had five strong legs, webs and venom. Tekkud was beaten against the stones and shaken to death as well. Atis Isanlikot, Thob, and Atis Rikkorslan followed in individually, but all were caught in the webs after which they were shaken and slammed to a pulp by Ruluzar. 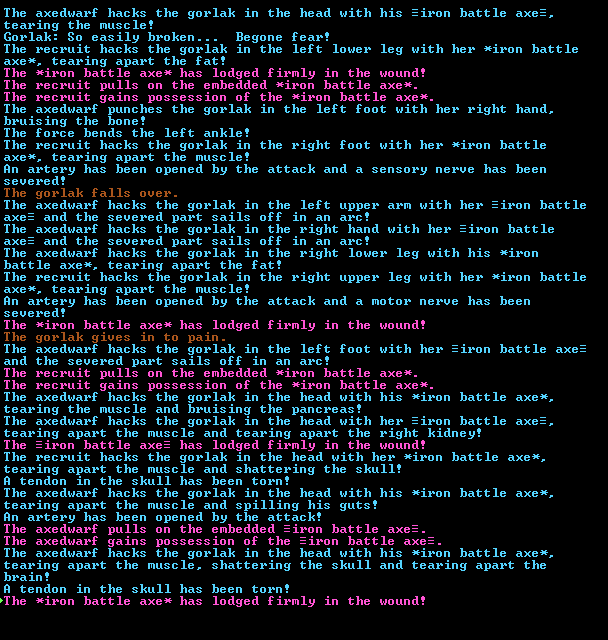 Finally Urist and Nix came in together, and Urist, with a blow to the cephalothorax, destroyed the great spider’s brain. Nix suffered a blow to head. Rigoth Eralnitig is going to collect him and take him to our remodeled hospital. On the 18th of Timber, Nix was brought to the hospital. He left shortly after. Once the dead are buried and the armor collected, we are sealing the caverns for a time. OOC: I had combat logs, but my computer ate the screencaps. Sorry! In order to lift our spirits, we have decided to create a grand dining hall, three levels of soaring stone with table and balconies and booze and roasts. Nish Thobudos has been possessed. He made a gemmed scepter. I should have expected this. We have closed the cavern entrance. As we come to the end of the year, it has been a busy winter. The grand dining room has been carved out. We have finished half of our bedroom complex. The farms have been expanded below ground, and the kitchen has been overhauled. I’ll include in this entry a Glowing Imagination Fakescape showing the fortress as it currently stands. Our military has been set back, but with the new year we shall finish our current projects, set up a library, and truly begin work on our above ground fortifications. Once we pass one hundred souls, we shall also draft another squad. Our currently plan is to keep our fortress half devoted to the military, and once we have the last few pieces of industry complete this may be eminently possible. We may also delve to find magma. While we have a great stock of coke, we must free up labor to trull ensure we can get our metalsmiths working full time. OOC: I'll try to do some interim dorf updates later! Nice turn, lots of action. 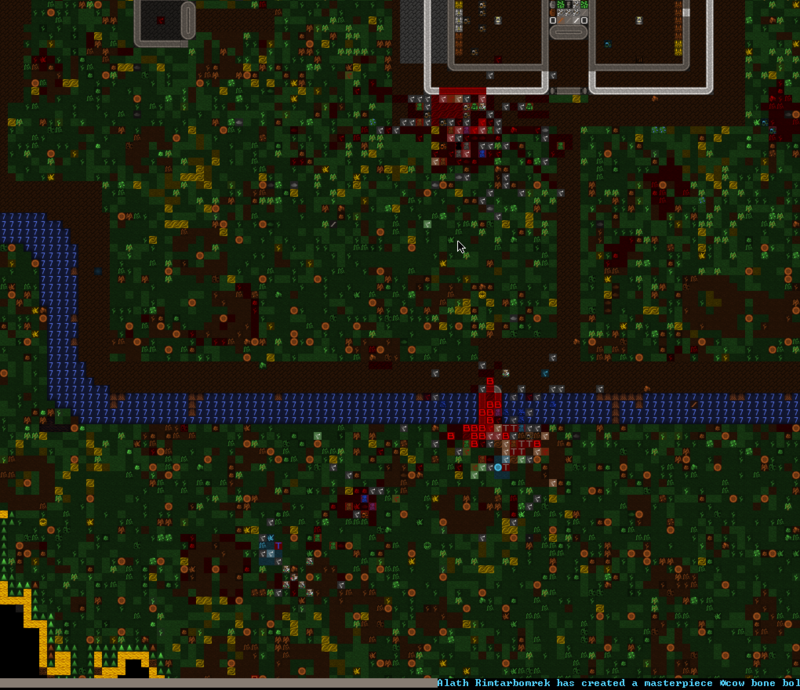 So scared my dorf was going to die. Any plans to introduce ranged fighters? 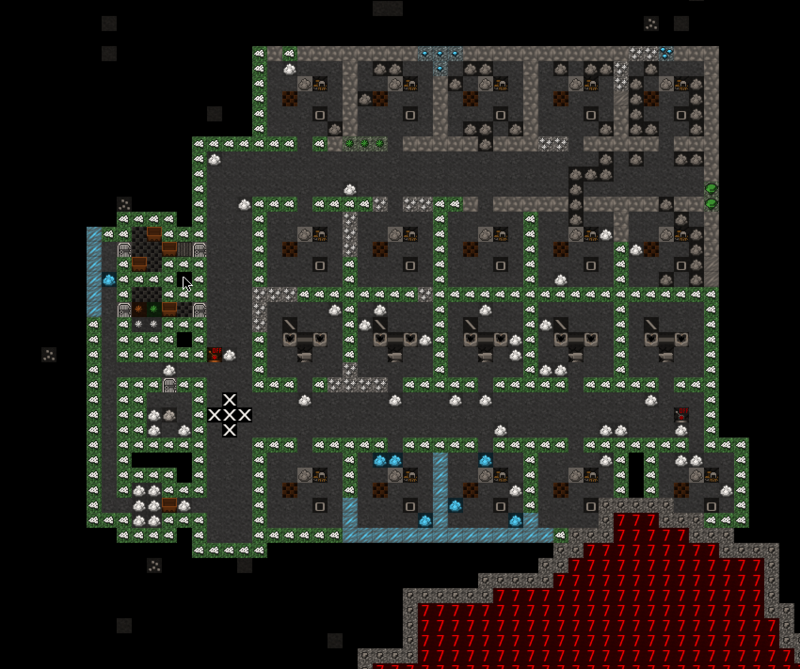 How are crossbow dwarves in this version, anyway? The population just surged to about 112 in the beginning of year four, so I am starting to think through how to expand the military. My thought is a marksdwarf squad and a spear squad. That way we have one of each of the main weapon types, plus two squads we can begin sending on expeditions. I think I'll have the underground fortress proper completed this year, which opens up the option of starting to poke our neighbors. I have no idea how good marksdwarves are. I usually engineer battlements and such to make sure that they succeed on quantity instead of quality, in that more bolts == better, and it helps mitigate the need for armor and such. I've also been trying to avoid traps and ranged killing floors in my design, if only because they work so well that it can mitigate the need for more than one squad. But we did just encounter something that may be far safer to deal with using range, so my plans might be accelerating on the marksdwarves. Lord Lemon has become our dog herded and general animal trainer. He has at least 5 dogs assigned, and is training all the animals in our fort at this point, which includes two cougars and a grizzly bear, with about 20 or so total beast. Everyone is actually pretty happy. However everyone is hoarding food in their rooms and temples, so we had to dump almost 100 fine and lavish meals that went bad. Clothing wise we are going through stuff slowly, but it seems like sparring maybe damages armor, as a lot of our locallly made armor has taken damage without any new combat events coming up. I also have full armor sets for all four squads and have them set to wear it all the time over their clothes, but they keep dropping it all over the place. If it matters, I have all the squads on month-on, month off rotations. Perhaps going quarterly will help fix this behavior? 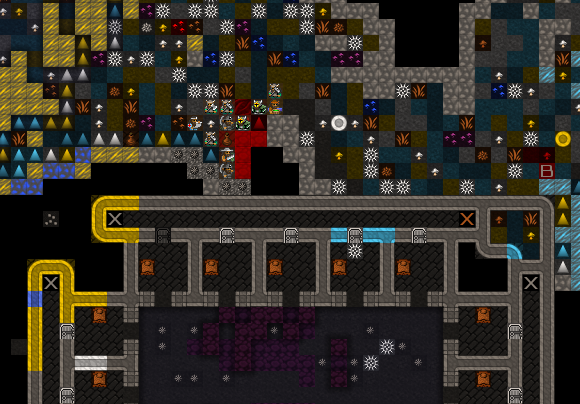 From a performance and dfhack standpoint, I recently enabled teledwarf (fastdwarf 0 1, NOT fastdwarf 1 1), as my FPS tanks randomly into the teens once I got past about 80 dwarves, and stays near 40 with teledwarf. I turn this off for any combat events that occur. Other than teledwarf, I occasionally using cleanowned and autodump. Big picture, we had some stuff happen in year four that caused me to decide to keep the caverns sealed and stop accepting combat petitioners. 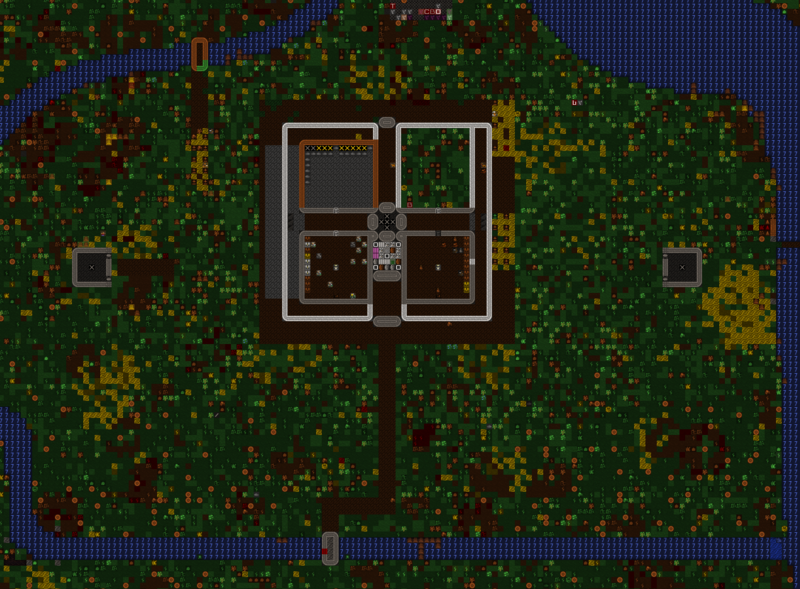 My goal is to get the whole fort "built" and running so I can then dive into the raiding system and, barring any other goals, eventually just conquer the world or at least get all the goblins to come siege me. Ahh. Such death! Such fury! Such pointless artifice! I generally followed the petitioner poll results until about year four. 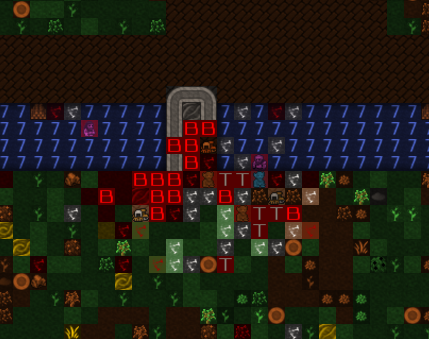 The monster hunters kept dying and I had to make graves for them, so I decided that was dumb. Moving on. new poll. I am pretty much going to play through until this weekend, when I'll be leaving town for a week. We currently have two forgotten beasts bouncing around in various caverns. The poll is, should we leave them be and keep training, or should I try to breach and fight them? 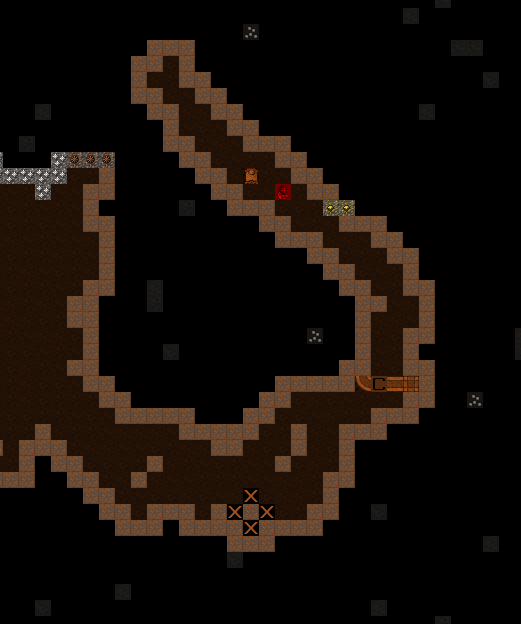 One is cavern level 1, one in cavern 3. Somehow I missed cavern level two completely! But aside from these things, the fort has had a very uneventful year. Oh, l almost forgot, we have two forgotten beasts roaming the caverns. We shuttered the caverns, but still can hear the beasts now and then. Next year we will slay them once we redesign our cavern access safeguards! OOC: I am taking these from a few months into year five. Justine the hammerdwarf is a level 6 hammerdwarf, no kills yet. No notable relationships, but lots of acquaintances.. Generally happy, seems to be a career military dwarf at this point. Nix is a level 8 axedwarf, no kills. His relationships are notable in that he has a pet ewe and has a passing acquaintance with a human dance r and that is all. Kinda odd. Lord Lemon...has seven pet dogs at this time. He's got a handful of passing contacts, but generally seems to spend his time training animals or himself. Very interested to see what these cavern access safeguards are. Could I please be dorfed as a hammerdwarf? The safegaurds... did not go as planned. One a positive note, the new raiding system is fun, and will become a large part of this fort. Year Five is almost complete and has a combined kill count that far exceeds everything else by a long shot! We have at least three raids, forgotten beasts, a siege, and a bug/odd behavior that killed half a squad and means a season of building was a waste will need to be redesigned! I'm traveling starting tomorrow night, so the full write up may not come until post Christmas. AllegedOne, you want a master or normal hammerdorf? I'll take a normal one. 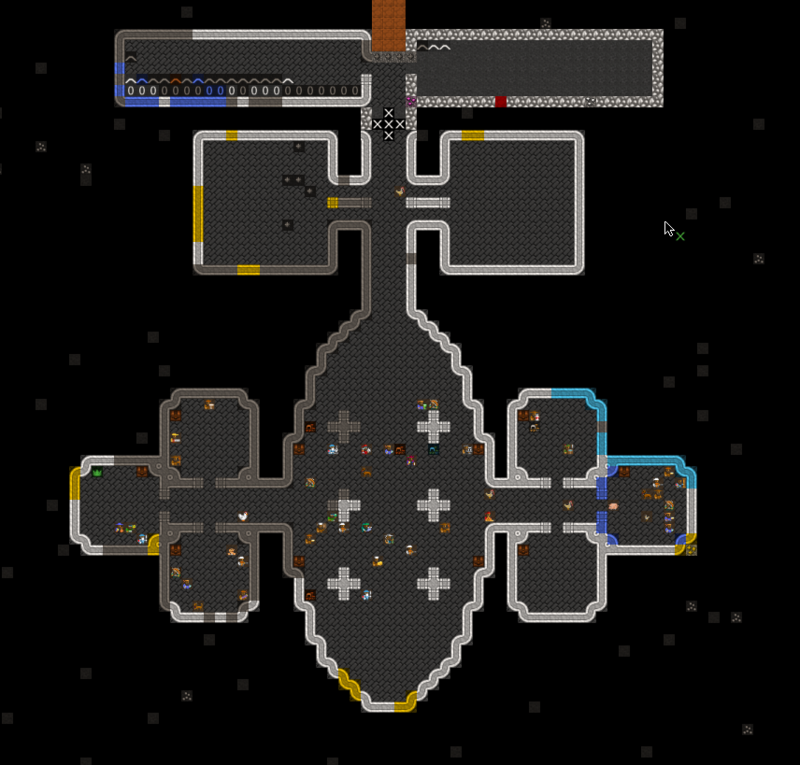 The elves have come to our fortress again. We got some animals and food from them, and some instruments for the temples. We are carving out a chamber and tunnels to get to each of the forgotten beasts down below. Athel Bistolkeral has been taken by a mood. He is a weaponsmith, so maybe we’ll get something good out of this one. He made a copper short sword… getting better! We are beginning our first wall for our major above ground fortifications, and then we will begin clearing the island of impudent trees. We are staging to take down the forgotten beast in the first cavern layer. So it turns out our staging chamber led to a portion of the caverns that was unconnected to the rest. We doubled back and cornered the beast. The beast was slain with a rather underwhelming lack of violence from the beast. No one died. Imush Regaroth named his iron war hammer. We are beginning our first wall, and then we will begin clearing the island of impudent trees. Building of the initial tower block is underway. We are sending the First Axes to raid Ropefly, a goblin settlement a few days travel away. We will Pillage it. The First Axes have returned! 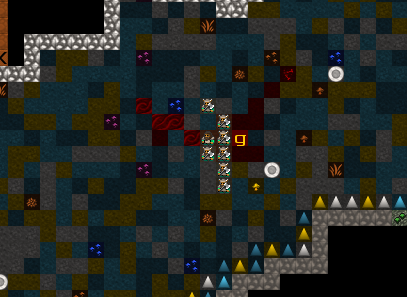 They were successful, killing a handful of goblins and bringing back some loot. We now appear to be at war, and we are preparing for potential reprisals. 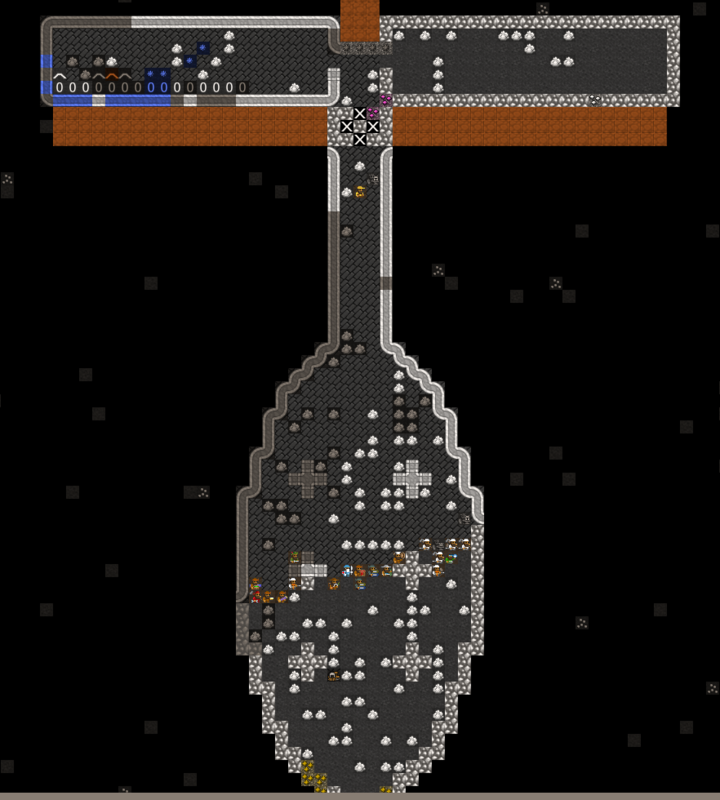 Also, one of our craftsdwarves made a tetrahedrite bed during a mood. 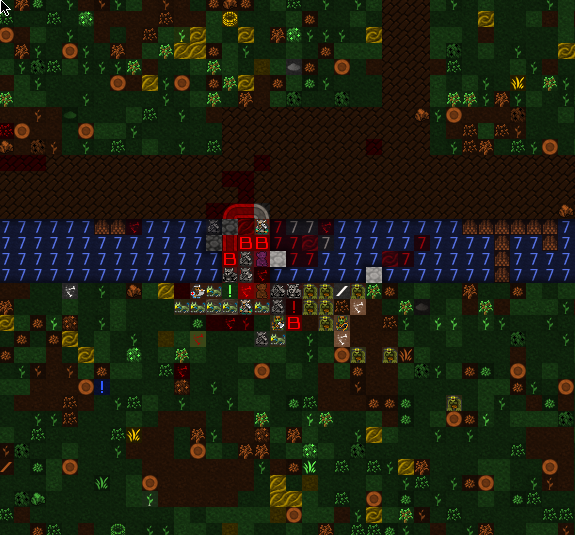 We are sending the First Hammers to raze a goblin site. The Hammers have returned. They killed a few gobbos, and the loot was again unremarkable. Another forgotten beast, Muved Kozimun, has come to the third cavern layer. 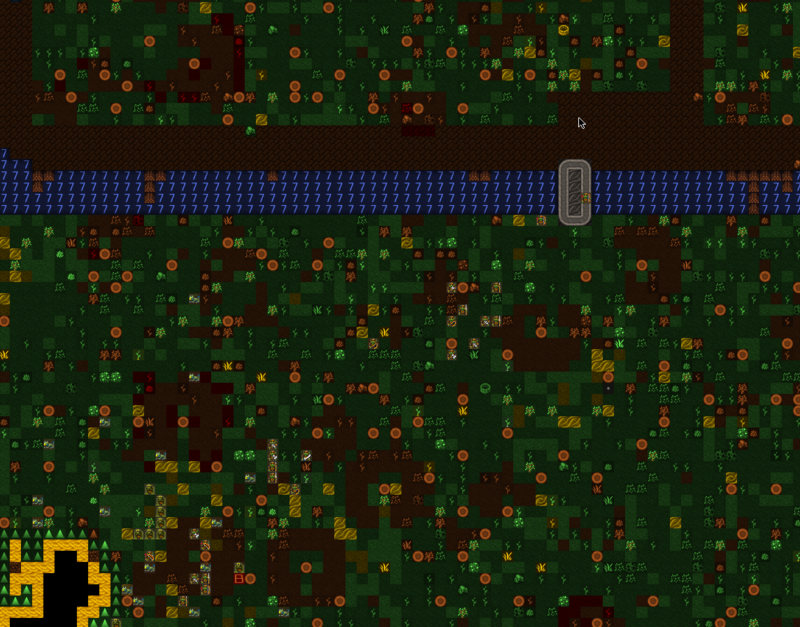 It is a water blob with wings and a bloated body, and it has webs! We are sending another raid to Ropefly! We have built a pair of archer towers and are paving much of our island. We plan to raid goblins until they begin attacking us! On the second day of winter, our foes finally arrive! We all staged, with marksdwarves upon the ramparts. Something went wrong with our fortifications, however, as our marksdwarves all feel through the fortifications, and many were slaughtered. We opened the gates on the archer towers and sent in our melee troops! All three squads present flew into battle, smashing through the goblins and beakdogs. After clearing the first wave, we pulled up the bridge to re-stage. Upon lowering the bridge, we laid waste to the remaining forces. In the end our most notable injuries were two deaths to dwarves that fell into the moat and had no way out. The poor souls drowned. 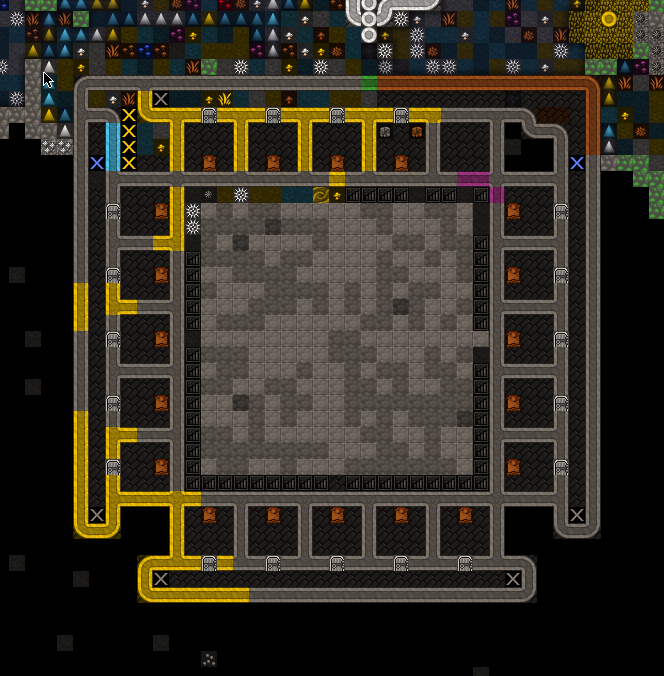 We’ve ordered engraving of slabs to let our craftsdwarves consult the stones and ascertain exactly what happened during the battle. A Minotaur, Cire Omo, has come. Due to lax lever control, we had the main doors shut, but the archer towers open. There was much frenzied sprinting around the main keep, but in the end all three squads were able to converge on the beast by the east archer tower. It fell quickly to our blows. Out of the blue, Sigun Coaldives just became Queen, and I think she retired from the second hammers. Time to carve some proper rooms for her. For reasons I do not understand while we house the Queen, we are not the capital of our people. Strange. I went to talk to Our current mayor, Ingish, and he informed that Lord Lemon is also a baron. Who knew? I guess I was a bit busy having another tantrum. Luckily no one was hurt this time. Also, there was a crash that happened at one point during year Four that seems to have wiped Arnie from existence. Redorfing Arnie and Alleged One as of early Year Six. Due to developments, we get a subplot starting early in Year Six. Grimmash... kept having tantrums and started a kill count. Normally I would just find a convenient way to kill her. But with Missions, we can create one-dwarf reaver squads! I am also going to skip over mundane stuff, and focus on "big events", as the fort is hovering at my population cap, and trading has gotten to the point where I can just guy out anything we want. I also plan to do a mini write up of mission mechanics after year six.